This is a fabulous example of an informal leaning Sweet Plum (Sageretia theezans) indoor bonsai. It is a very natural bonsai in appearance with beautiful red tipped foliage and stking aged trunk with a gentle twist. Lovely aged flakey bark. Potted into a contemporary black ceramic pot with matching drip tray. An outstanding bonsai with very natural appearance. 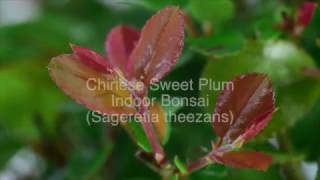 A lovely bonsai variety for beginners, with purple fruits as it matures. Lovely proportions and pretty canopy. * Pot details: contemporary black ceramic bonsai pot.